“Is there is any RAT in Indian Airport?”, Colleague Miss.Kristine asked me last year. I surprised and asked back with half closed eye. What?!! From where you heard. She continued that her friend is working as Airhostess. Once she landed at Indian Airport and found a lot of rats and they don’t kill as they believe it’s their GOD. Yeah she is right Chances are there they don’t kill because In Hindu mythology RAT is the vehicle of God Ganesha. I told this and said anyhow I haven’t heard such Airport . She wasn’t leaving me You are from India and how couldn’t you know? I faced similar question from others when I traveled abroad. In that case I explain them that India is one of the biggest country. But when they look, its one India but In real each state different culture, different local languages and different climate. That’s the reason India is known as Unity in Diversity. Now why I am saying this story happened year ago. as an Indian I always feel, I must travel places in India before travel to outside country. but some circumstances doesn’t permit me. I never traveled in Indian places other than Bangalore, Chennai and some of Kerala. I can say that traveling whole India is equal to travel in whole world (how, explain in End). Time has arrived. I am traveling to India – Nepal – Bhutan on 08 Oct 2016 on Car with great Companion i.e M.Dileef (Guinness Record Holder & Caricaturist), Nisar Kolakkadan (Wildlife Photographer), Salim Groad (Graphic Designer) & me. 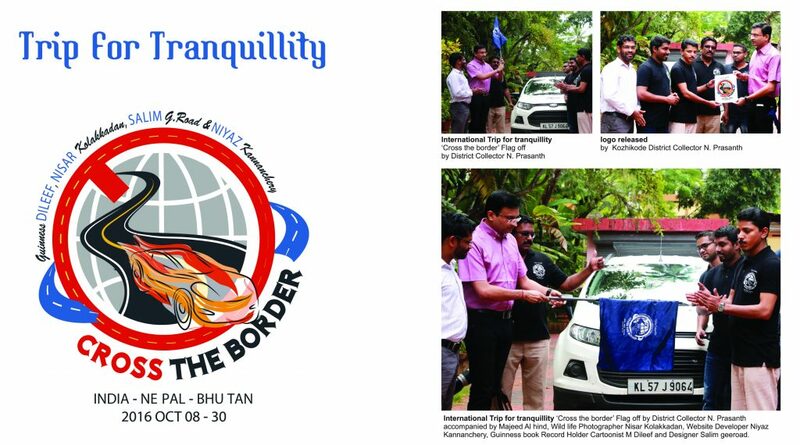 we named it as CROSS THE BORDER – a trip for tranquillity. even we mentioned ending date on 30th Oct 2016 we don’t know when exactly return back home. by the way Current scenario , relation with India – Pakistan is not good. both Soldiers are playing Pokémon with weapons. So that Government tighten security in Borders. We are not sure how Dangerous this journey might be. but we trust in God that nothing happen and we depending on him. Even me staying in home also dangerous (Kidding) its been an year staying without Job. If I stay in home always, you know what parents say. ahem ahem. last many years I engaged myself in many activates and made myself busy. doesn’t mean that Opportunity is not there. But was waiting for good opportunity while experiencing different things. Coming Year 2017 I will enter in Job. If God willing. Yesterday we went to Calicut Collectorate office to get a Letter for Journey just as security precaution, Calicut district collector Mr.Prasanth (we call him as Collector bro) to seek advice. his reply was quite interesting “Nepal and Bhutan is also a India. Just go. Relax and Enjoy”. 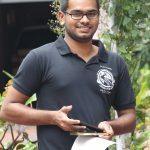 If you ask a Kerala youth who is collector bro all say only his name (remember in Kerala 14 district and each has one). he is very friendly like a new Generation even he is decent in dressing. We invited him for Flag Off. Even though he accept public invitations very rare but accepted our invitation that gave me immense pleasure. I have a write up about him and post in coming month when it complete. To write something about him you can guess how inspiration he is and how big fan I am. I believe this travel must be adventures and will be safe. Need everyone’s prayers. Anyhow Miss.Kristine Hope I can find your answer from somewhere. Because our travel is through different village of Indian states. Ending with a story ending which I mentioned below. After God created Earth he went to Gulf, he gave them desert. Angel said “God, this people suffer”. He replied No, inside of this sand I hided Gold, then he went over Israel and made those people more Clever, Angel said “God, this people destroy World”. He replied No, I never give them peace. He flew over different countries and did same like this (I forgot those). Finally he reached India He left with things. Angel asked “What will YOU give, you are empty now”. What God did was he took some from other countries and gave to different states. If you Go to Rajasthan state you can see desert, Jammu Kashmir is same as Switzerland weather. Finally God tired and choose place to rest that is my Kerala where you can see mountains, waterfalls, sea, river, forest. that’s why Kerala is known as God’s own Country. NB : anyone who like to visit my land Kerala, I will be on a call for most adventure and thrilling tourist spots.